The sun came out for a few brief but heartwarming hours when advocates, community organizers, and city and agency staff gathered to share a hearty meal and celebrate the announcement of a grant of $700,000 from the ride-hail company Lyft to the city of Oakland. One is a community-driven “placemaking” effort. It will bring together local organizations to guide a participatory design process around future bike-share stations in East Oakland. Lyft, which bought Bay Area bike-share company Motivate, has plans to expand bike-share into the area, and local residents have already expressed interest in having bike-share in their community. What has yet to be decided is what that rollout will look like, where bike-share stations will go, and what form they will take. This open-ended effort could redesign bike hubs, create parklets, or bring forth new projects/programs based on what the local community wants. The second part of the initiative will support organizing by the East Oakland Collective to find out what community members need to improve affordable mobility in other ways. The plan is to create a pilot program that could include subsidized AC Transit passes or Lyft fares, bike-share or e-scooter share memberships, or other ideas to be determined in the process. Another part of the initiative–about a third of the total funds–will go to a bike lending library designed and run by Scraper Bikes. For years, that local bike collective has been working with TransForm and the city of Oakland on improving access to and safety for bike riders. 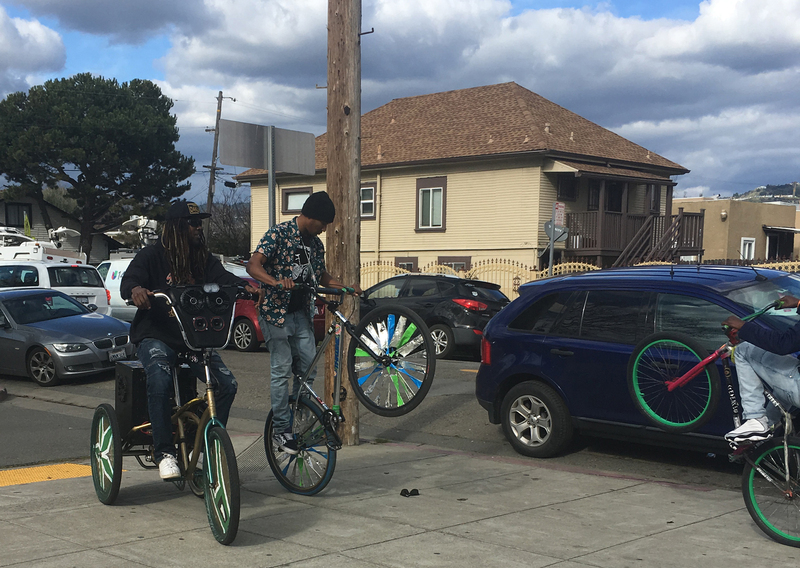 The Scraper Bike Team helped the city expand access to Oakland’s low-income bike-share membership. They also brought together community members to design an unusual, center-running bike lane along 98th Avenue in East Oakland. According to Champ, one of the group’s founders, the library will allow residents to check out bikes on a long-term basis as well as offer bike repair training, with an eye towards job certification and increasing transferable job skills. Members of the Scraper Bike Team wait to ride. RB, at left, and Chuck Davis standing up on the bike. Joining in the celebration were Oakland Mayor Libby Schaaf, new local Oakland city councilmember Loren Taylor, Lyft CEO John Zimmer, and the company’s chief policy advisor, former U.S. Transportation Secretary Anthony Foxx. Schaaf called out the “amazing, talented Scraper Bike Team” for special notice: “You make us so proud!” she said. 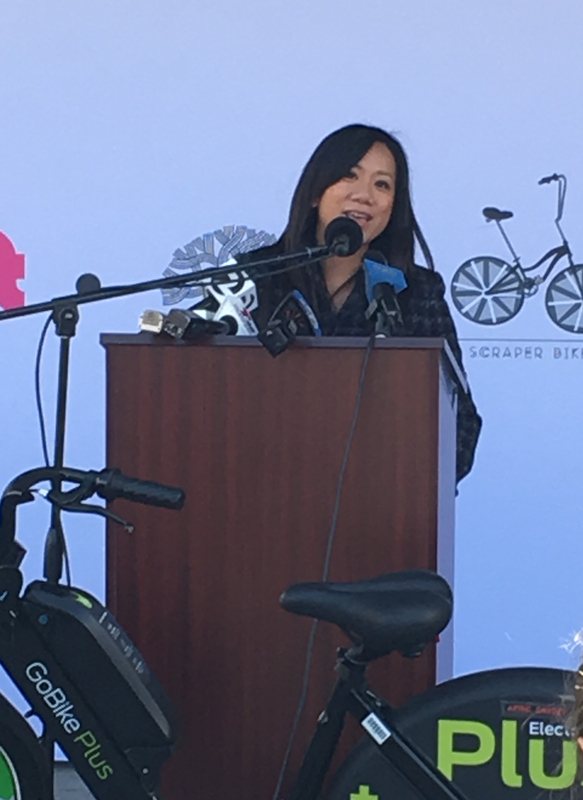 “We’re proud to stand alongside Scraper Bike Team in this work,” she said, extolling the work the partnership with them has already achieved. Scraper Bikes helped in the outreach for bus rapid transit, participated before bike-share “hit the ground” in Oakland, worked on equity outreach for the bike-share system, and are “changing the game on how bike planning can and must prioritize the needs of black and brown communities,” she said. Lyft has had a community grant program for the last year, but most of those grants have been awarded to give people rides on Lyft. While discounted Lyft fares may end up being part of this initiative, that is not its focus. Curious if readers might be curious about how the age limits of bike share – it’s 18 for Ford GoBike – affect the growth of youth cycling. There’s unfortunately little or no research on it. There are some systems with 16 limits like Chicago’s Divvy – e.g. Citi Bike or Biketown (Portland) and even a few with 13 (Lime… e.g. in Alameda etc.) and B-Cycle in Austin… and 12 for the system in Lincoln, Nebraska! – but I’ve never heard of a change after a roll out, except in Austin, where it was lowered after they found that people were using it below the requirement, and changed the rules to fit. I’ve heard of some down-low or behind-the-scenes discussion about Bay Area Bike Share/Ford GoBike’s age limit from people at Bike East Bay and TransForm, but there’s not be a change. Further north and east in the Bay Area Megaregion – what I like to envision as the “Bay-Delta Supercounty’ – JUMP has the monopoly bike share program in the Sacramento area, so for now all bike share up here has an 18 year-old min. age limit. (A reminder: There are no age minimums for Type 1 e-bikes in California.) It’s bad enough that the kids here in Davis – where I am on the transportation commission – has probably some of the most experienced cyclists of their age in the country as bicycle modal share use is higher than anywhere else in the country – cannot use the system, at least officially: What this means is that parents with good credit risk it to let their kids use the system against company rules. My guess it that parents with not as good credit won’t take as many risks… and that has disproportionate effects on people with economic challenges and black and brown folks in the area. Here in Davis a kid can drive to high school and park for free but can’t pay to ride bike share to the same destination. My response is a fun one: I am trying to see if any age minimum for bike share here – the bikes are designed for people five feet tall and up – is a violation of Federal Law: The Age Discrimination Act of 1975 precludes a system that discriminates based on age from receives Federal funding. SACOG, the regional agency responsible for transportation, uses it to administrate bike share. All of this ageism that runs counter to the mobility policy of Oakland and many other cities and regions – and might run foul of Federal law in certain places – is largely the result of bike share not being part of the Commons in nearly all USA cities (Los Angeles Metro is an exception, as they run their own bike share system). “Commons” means the opposite of what is said in the user agreements for all these bike share – and scooter share* – operations: That these are not “common carriers”, with no general obligations to the public. We don’t run our buses and subways like that… why do we do it with micro-mobility sharing? * California law allows use of an e-scooter at age 16, just with a learner’s permit; the operators all have an min. 18 limit.